San Gimignano. This is where our adventure begins today. 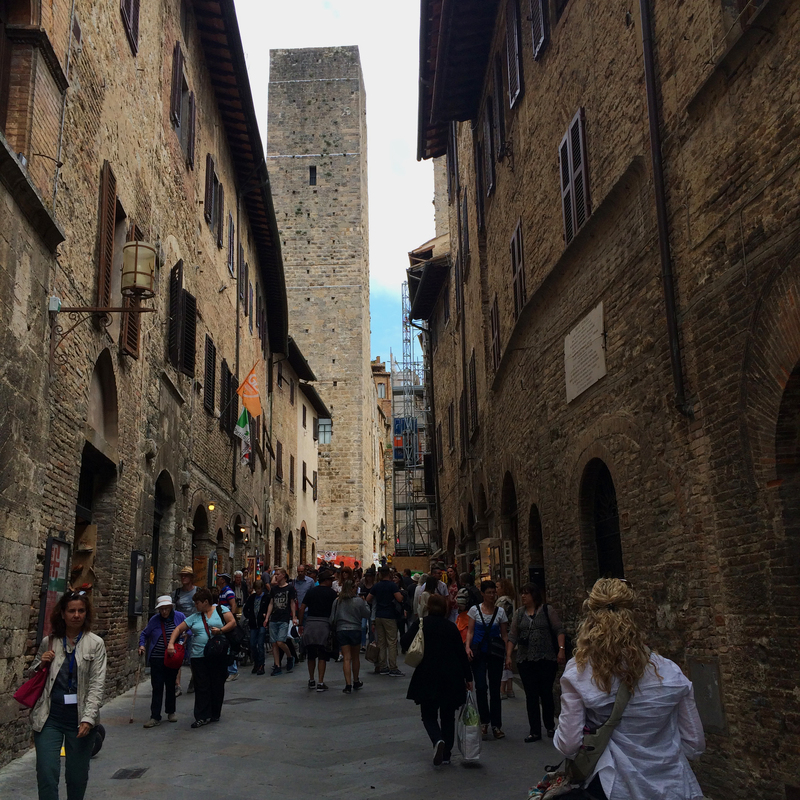 The walled cities and towns we’ve visited so far have been a mix of stucco and stone, a few bricks maybe, all in the warm sun-worn colors of Tuscany herself. And, of course, the bright but faded colors of the small towns in Cinque Terre. 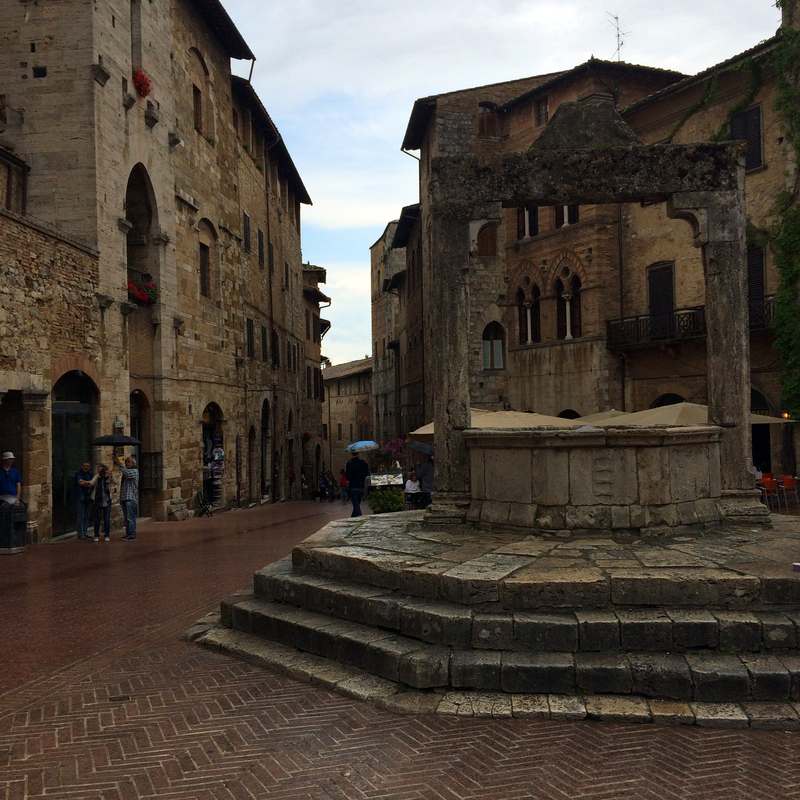 By contrast, the two towns we are visiting today are all stone, massive, solid stone. 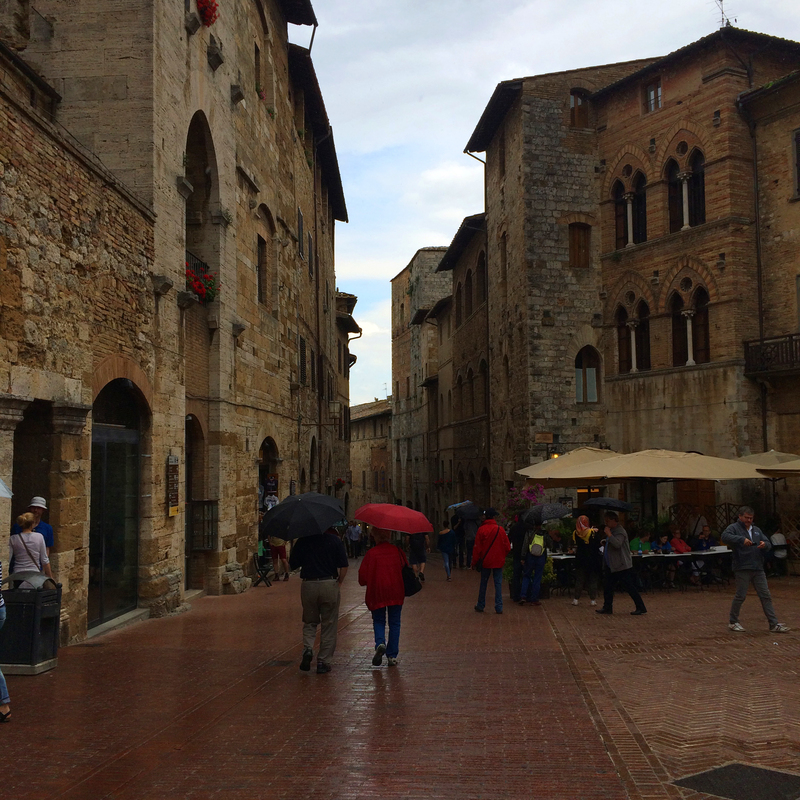 San Gimignano is our first stop. Rising up from the earth, surrounding the city, are stone walls that were born here and are only made stronger and more settled by history. Etruscan built with nothing but weight holding them in place, no mortar or cement, they defy the ravages of time. In places, certain periods reveal themselves with additions and repairs made of brick or a different, lighter stone. This town, by comparison to the other quiet hamlets we’ve visited, seems alive with visitors. It is so tempting to peel away from the group and run to every corner and overlook to take it all in, all at once, like a kid ripping the wrapping off of every gift before even playing with the first one. But I obey the request of our leader and only side step away once or twice. I just can’t help it. There is a beautiful old church here. Let’s be honest, there are probably 50, it’s what they did. But there is one in particular we are going to visit. The duomo. But first we must take care of our gastronomy. We come upon a lovely outdoor cafe and sit. All of us, well almost, two have escaped to shop and will continue to do so our entire time here. We mostly order wine and pizza. When in Italy… Sitting at an outdoor cafe with a crisp glass of white white and a super thin crust pizza people watching IN ITALY is my new favorite thing to do. But the church is calling so we must take our last gulp and excuse ourselves. Once again underway, we pass a cistern that now serves as a wishing well. I toss an American penny in with my wish. It’s a secret. This church, like so many other duomos central to their villages has an undeniable presence. Surrounding the duomo and as part of the cathedral itself, are many towers. There seems to have been some sort of competition going on. *Ahem* Inside the nave of the sanctuary are unimaginably tall frescoed ceilings and frescoes on every wall depicting scenes from the bible in great detail and chronologically placed. These ancient churches, grant up close and personal access to some of the greatest art in Italy. It can become very easy to dismiss the art because of its ubiquity, but that would be a mistake. Each panel in each church tells its particular story; its wealth, its power and its devotion. Some of the paintings will rival Michelangelo’s Sistine Chapel, while others seem rudimentary. For me, the important thing to take in is the amount of time that has passed since each painting was completed and the fact that I am standing before it. The amount of history, wars, changes in fashion, politics, technology and the climate between it and me. At the front of the church, facing the apse, I sit down just to take it all in. There is a strong positive energy here. I’m held in place by it, or really rather invited to sit a while to bask in it. So I do. I am allowing myself to slowly take in the sculptures, to examine the people who are here to experience this place as a museum, recognize it as a shelter or a safe place to release long held burdens. I am completely calmed by the energy, grounded. It’s, dare I say, angelic. I linger as long as I’m allowed, but we have a schedule to keep. We walk back through the stone streets, between the stone buildings with wooden doors rich with age and weather, and flower pots full of red begonias. Outside the duomo, the history lesson continues. Over 1700 years of footsteps have walked these streets before me. How many hands have pushed open the giant worn wooded doors? How many plots, political coups were hatched behind them? How many births and deaths inside the walls? Living here, and over 7,000 people do, must create an indelible connection to the strength and history of such a place. Is it possible to wander the streets and not feel it? I notice a gap in the buildings to my right where I suspect a vista. I quickly and quietly disappear toward it. When I look back I see Bill step out of line to watch me. This has become his job. He is to ensure all the sheep make it back to the flock in time to visit the next town. I am afforded a long leash. And I will not abuse his kindness. 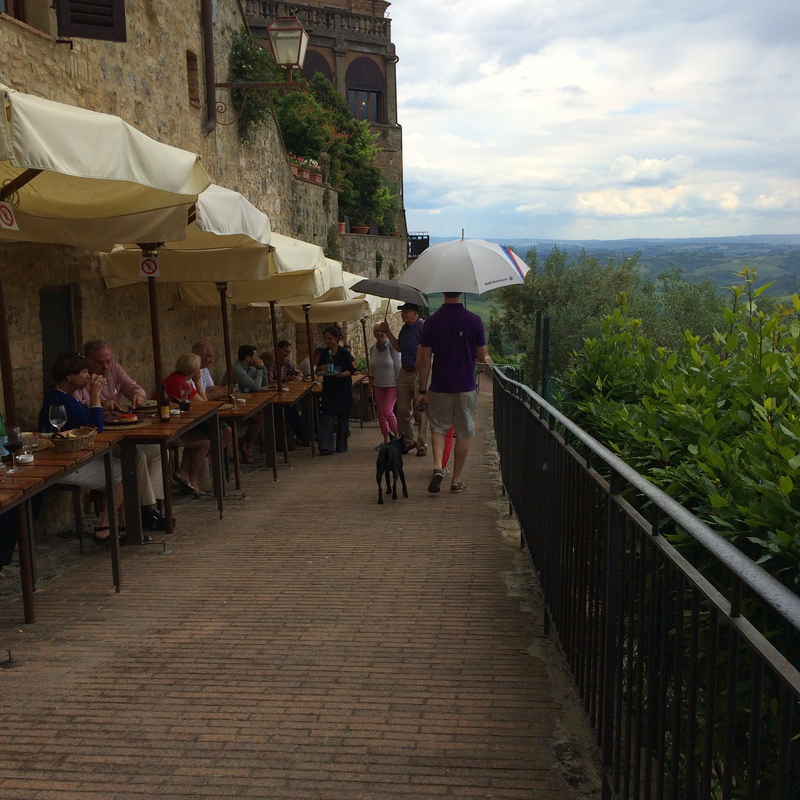 I find a gently sloping road atop the wall of this city with tall buildings on the left with a single row of umbrella topped tables hugging their facades and a railing on the right affording more beautiful views of Tuscan farm land and vineyards, rolling hills and pointy trees. 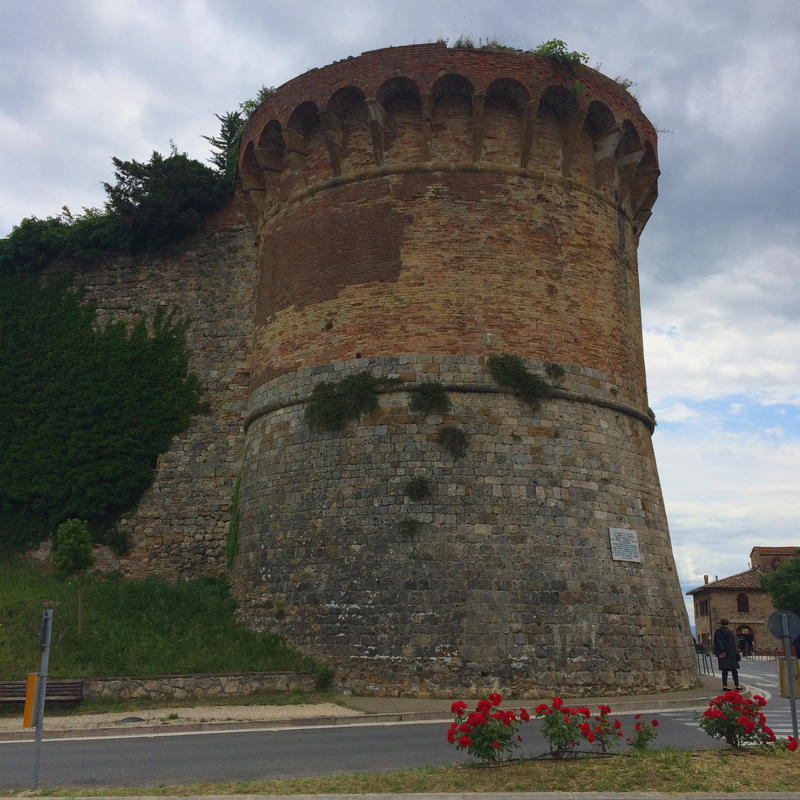 The walls that once allowed the residents of this town to watch for approaching armies and enemies, now provide a perch from which to gaze upon incredible beauty creating a sense of peace and comfort. Perhaps other countries suffering the fates and ravages of conflict now will be able to share this same history soon.